Everyone who signs up at Crown Bingo receives a £1 Welcome Bonus upon joining so that cash play can begin immediately. There is an additional Bingo Deposit Bonus for new members, awarding £25 free when an initial deposit of £10 or more is made. Using Virtue Fusion software licensed in Alderney, Crown Bingo is a bingo room owned and operated by U.K.-registered Online Domain Services, Ltd. The site made headlines in April 2009 when a member from Bristol, who had joined up only ten days before, won a popular side game called Lucky Ladies 88. His £2 bet paid out just over £240,000. The web site’s own Progressive Jackpot is currently valued at £18,263 and rising daily, and the link-shared Clover Rollover Jackpot has reached a staggering £3.1 million. 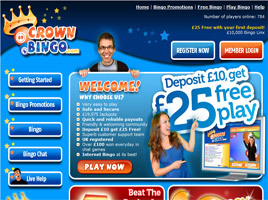 Crown Bingo uses English as its primary language and the British pound Sterling is its main currency. No download is required to play. All varieties of Bingo are hosted at Crown Bingo, not just 75-ball and 90-ball but 80-ball as well. In Room 1, the big prize games are conducted along with a mix of penny games available 24 hours a day. Room 2 is where team bingo and tournament bingo takes place, complemented by a variety of chat games and quizzes between the hours of 9am and 2am GMT daily. The site managers like to pint out that their games are easy to play, safe, and secure. Payouts are quick and reliable, and customer support is excellent. Newcomers will discover a friendly and welcoming community. And to ensure that absolutely everyone can enjoy the games, an entire section was launched in 2008 for Free Bingo, offering two real cash prizes daily—the £1,000 Piggy Bank Jackpot and the £25,000 Cash Cow Jackpot. Today, Free Bingo is still played in Room 2 every day at half past the hour between the hours of 11am and 9pm. Each game puts £10 up for grabs, which is £100 give away every day for free. Additional freerolls are scheduled on Fantastic Free Bingo Sundays, doubling the number of free bingo games to two every hour between midday and midnight. Another way to win big at Crown Bingo is in chat games. There is £100 on offer every day, with up to £15 going to the top players and £1 of free bingo money being the minimum. Tournament bingo takes place on Tuesday mornings starting at 10am and in Friday nights from 6pm. There is also monthly Team Bingo, allowing groups of three players to accumulate points toward their share of share £500 in free bingo money. One of the latest innovations here is Bingo Studio Live. It is a new room for 90-ball bingo players, called by live presenters every day from midday to midnight GMT. Another new offering is the Deal or No Deal 90-ball bingo room with its four prizes awarded, rather than the usual three, between 9am until 1am every day. The 80-Ball Bingo Room is open from 9am to 9pm GMT. Speed Bingo is available in the 90 ball bingo room from 4pm to 8pm. The 75-ball Pattern Bingo room is open between midday and 4pm. And the U.K. 75-Ball Bingo room runs 24/7 for bingo action any time, day or night. There is even a Joker Jackpot room creating winners from a deck of playing cards from 9am till 2am daily. The list of regular promotions available to players includes cash bonuses, freebies, giveaways, additional deposit bonuses, prize draws, free bingo money, and more. For example, Big Money Monday awards an extra high-value prize to the top three winners of the games held at 7pm, 8pm, and 9pm, while the Leisurely Lunch promotion gives away £60 worth of Leisure Vouchers to midday players. Frequent lucky drawings have featured such prizes as a Spa day for two, Penny Bingo Specials are offered weekly, and BOGOF Saturday doubles every purchase made with two cards for the price of one. There is a £1,000 Piggy Bank bonus for a full house in under 40 calls in one of the 90-Ball Bingo rooms, too. Additional bonuses available at Crown Bingo include a free VIP mouse mat for VIP bingo club members—those who have been with the site over two weeks and deposited £20. The Refer a Friend Bonus is worth £10 for each successful referral. And tie-ins with Crown Slots, a related casino site, allow extra bonuses to be claimed in cross-promotions, such as a free daily scratch card.